The most common (≥20%) all-grade adverse reactions associated with enasidenib were elevated bilirubin levels (81%), nausea (50%), diarrhea (43%), vomiting (34%), and decreased appetite (34%).8 The most common (≥3%) grade ≥3 adverse reactions included nausea (5%), diarrhea (8%), decreased appetite (4%), tumor lysis syndrome (6%), differentiation syndrome (7%), and noninfectious leukocytosis (6%). In vitro studies suggest that enasidenib inhibits the activity of cytochrome (CY)P1A2, CYP2B6, CYP2C8, CYP2C9, CYP2C19, CYP2D6, CYP3A4, and UGT1A1. In addition, enasidenib inhibits P-glycoprotein, BCRP, OAT1, OATP1B1, OATP1B3, and OCT2. Enasidenib induces CYP2B6 and CYP3A4. In vitro studies suggest that the metabolite AGI-16903 inhibits the activity of CYP1A2, CYP2B6, CYP2C8, CYP2C9, CYP2C19, and CYP2D6. AGI-16903 inhibits BCRP, OAT1, OAT3, OATP1B1, and OCT2. The coadministration of enasidenib may increase or decrease the concentrations of combined hormonal contraceptives. 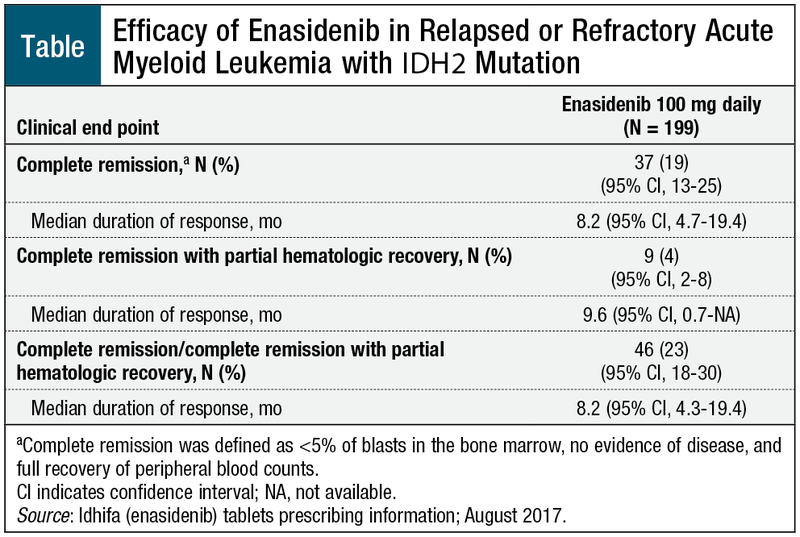 The FDA approval of enasidenib marks the availability of the first-in-class, targeted IDH2 inhibitor for patients with difficult-to-treat relapsed or refractory IDH2 mutation–positive AML.7,9 Taken as a once-daily oral medication, enasidenib may provide appropriate patients with AML a practical treatment option. 1. American Cancer Society. What is acute myeloid leukemia? www.cancer.org/cancer/acute-myeloid-leukemia/about/what-is-aml.html. Accessed October 16, 2017. 2. National Cancer Institute. SEER cancer stat facts: acute myeloid leukemia (AML). https://seer.cancer.gov/statfacts/html/amyl.html. Accessed September 12, 2017. 3. Seegmiller A, Jagasia M, Wheeler S, Vnencak-Jones CL. Molecular profiling of acute myeloid leukemia. My Cancer Genome. Updated January 26, 2016. www.mycancergenome.org/content/disease/acute-myeloid-leukemia/. Accessed September 18, 2017. 4. National Comprehensive Cancer Network. NCCN Clinical Practice Guidelines in Oncology (NCCN Guidelines): Acute Myeloid Leukemia. Version 3.2017. June 6, 2017. www.nccn.org/professionals/physician_gls/pdf/aml.pdf. Accessed September 18, 2017. 5. Wheeler S, Seegmiller A, Vnencak-Jones C; for My Cancer Genome. IDH2 c.419G>T (R140L) mutation in acute myeloid leukemia. www.mycancergenome.org/content/disease/acute-myeloid-leukemia/idh2/268/. Updated October 16, 2018. Accessed September 18, 2017. 6. Stein EM, DiNardo CD, Pollyea DA, et al. Enasidenib in mutant IDH2 relapsed or refractory acute myeloid leukemia. Blood. 2017;130:722-731. 7. US Food and Drug Administration. FDA approves new targeted treatment for relapsed or refractory acute myeloid leukemia. August 1, 2017. www.fda.gov/NewsEvents/Newsroom/PressAnnouncements/ucm569421.htm. Accessed September 8, 2017. 8. Idhifa (enasidenib) tablets [prescribing information]. Summit, NJ: Celgene Corporation; August 2017. 9. Celgene Corporation. FDA grants approval of IDHIFA, the first oral targeted therapy for adult patients with relapsed/refractory acute myeloid leukemia and an IDH2 mutation. Press release. August 1, 2017. http://ir.celgene.com/releasedetail.cfm?ReleaseID=1035377. Accessed September 14, 2017.